On Friday I presented at TeachMeet Soton some ideas about positive learner characteristics, and how to encourage them in your students. I called the presentation ‘Who Learning’ in that if our learners have the positive characteristics of Doctor Who- they would be more successful. Don’t worry, this was more than a bit tongue in cheek – but I have spent a lot of time this week with my learners getting them to think about how they are going to succeed in their exams. 7) Being willing to ‘play’ as part of learning. These are similar in many ways to the way teachers embed being a positive role model with many of the same characteristics in their professional practice. After all, how can we expect learners to be practitioners of positive learning characteristics if they are not aware of them – I wanted to encourage mindful learning. The lesson began with students discussing what they have to do to achieve excellent exam results. I then guided them to talk about how they should be. Interestingly the learners contributed many of the key words which I myself would have chosen such as, resilience, being determined, having aspirations and so on. I then tried something totally new. 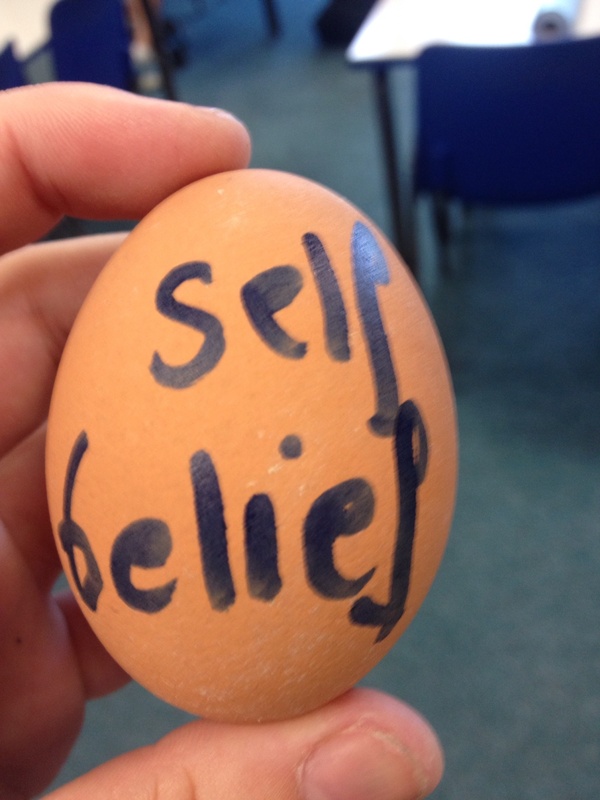 I had taken into work a carton of eggs, which were then labelled with ‘self belief’, ‘resilience’ and ‘motivation’ which the class agreed were the key characteristics. We then sat on the tables and gently threw the egg around between students. This is not an activity for the faint hearted. And yes, of course some got broken. However, this is the best bit, you get to model to your class that it’s OK; even desirable to take risks with teaching/learning, and if it goes wrong you can demonstrate resilience by just clearing it up. No need to hold back here – I was loud and clear this was just like their January exams, those that didn’t achieve highly, and had ‘messed up’ got a chance to clean up metaphorically by working hard for the Summer exam. Of course, the students loved this. There was giggling and general enthusiasm that even I don’t see in lessons – total engagement – but then I guess there would be if you might end up with egg all over you if you don’t pay attention. 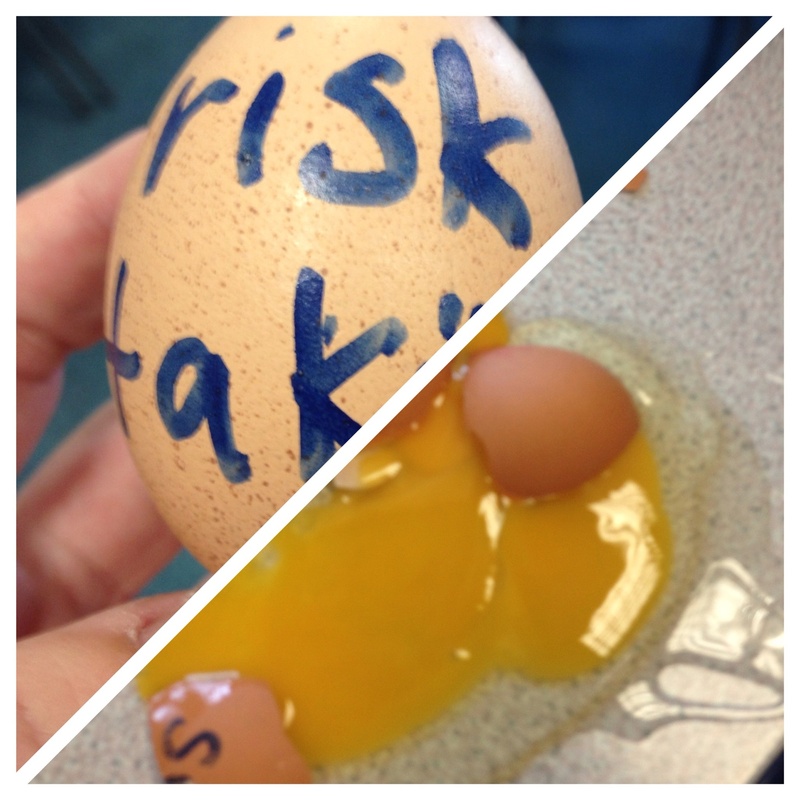 Come the end of the lesson, the only egg left was the ‘egg of resilience’, *irony not lost on me. Following this I managed to get to use the 500 paint colour sample cards I ‘found’ in B & Q a few months ago. 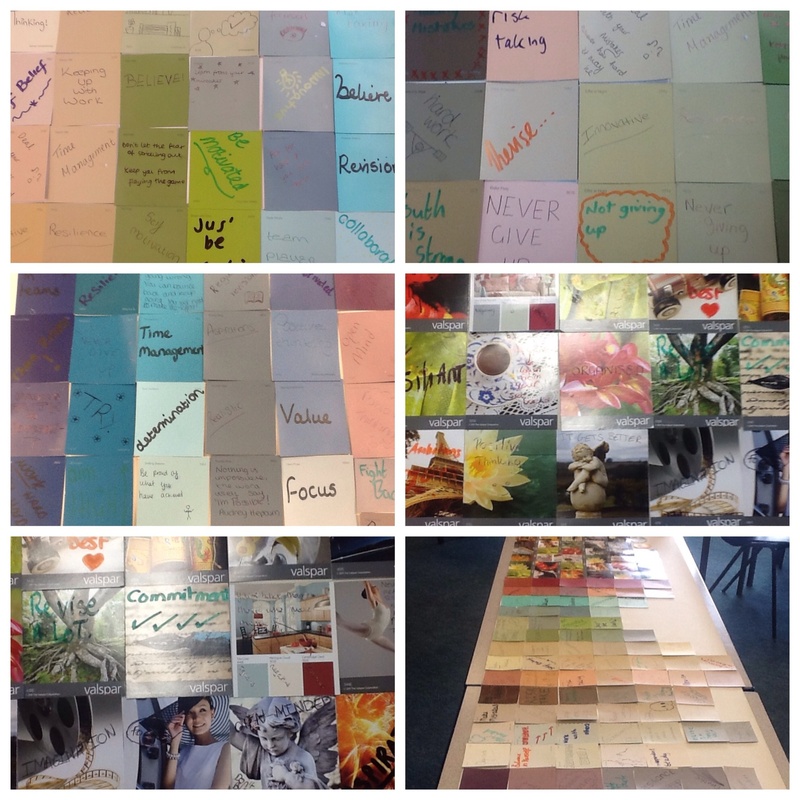 Each student was asked to decorate the card with one of the learner characteristics that they felt meant the most to them, and would make the most impact. They all managed to produce about 4-6 of these cards and they were asked to arrange them for display. I felt that throughout the process, the learners were really focused on not just how could they develop from thinking about these ideas, but also talking about how I demonstrated them. For example, I heard them talk about my willingness to utilise ICT and develop their skills not always knowing what the baseline might be. I heard them talking about my participation at TeachMeets and how I am still willing to take risks and learn. I really felt that not only did my classes benefit from this exercise, but I was made more aware of the importance of being a role model for positive learner characteristics. It’s no good telling them, you have to show them the type of learner you want them to be. Your learners might not come to you with these skills developed, but through planning and demonstrating how you want them, no, need them to develop as learners, you will see changes over time.